The team behind the New York Times bestselling Wolfie the Bunny and Horrible Bear! is back with with new Arctic characters in this hilarious learning-to-read adventure! Aboard the S.S. Cliff, First Mate Foxy reads an interesting fact: "Lemmings don't jump off cliffs." But Foxy can't get the lemmings on the Cliff to read his book, too. They're too busy jumping off. After a chilly third rescue, exasperated Foxy and grumbly polar bear Captain PB realize their naughty nautical crew isn't being stubborn: The lemmings (Jumper, Me Too, and Ditto) can't read. And until Foxy patiently teaches his lemmings to read the book, he can't return to reading it, either! 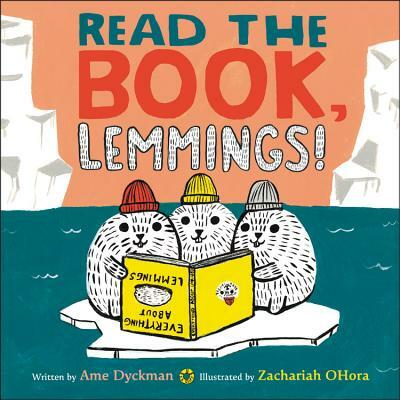 Ame Dyckman is the award-winning author of Wolfie the Bunny (illustrated by Zachariah OHora), Boy + Bot and Tea Party Rules, and loves writing for children so she doesn't have to grow up. Ame lives in New Jersey with her family, pets, and hair bow collection. Zachariah OHora is the illustrator of a number of children's books, including Wolfie the Bunny (written by Ame Dyckman) . His author-illustrator debut Stop Snoring, Bernard! was awarded the Society of Illustrators Founder's Award, and his book No Fits Nilson! was the Huffington Post Best Picture Book of the Year for 2013. He lives and works in Narberth, PA.